Much of the event at Lake Istokpoga has been less than hospitable to the anglers competing in the Jack Link’s Major League Fishing 2013 GEICO Challenge Cup due to Hurricane Sandy's approach. This second round of Sudden Death was the most challenging of all days. While the lake had been hit significantly with the leading edges of the storm, this second day of Sudden Death happened to be on the day that Sandy made her closest approach. Throughout the day, bands of dark clouds could be seen approaching on the horizon. As the bands passed, they produced monstrous wind gusts and toad-strangling rain fall. Simply put, it was a difficult day for fishing. 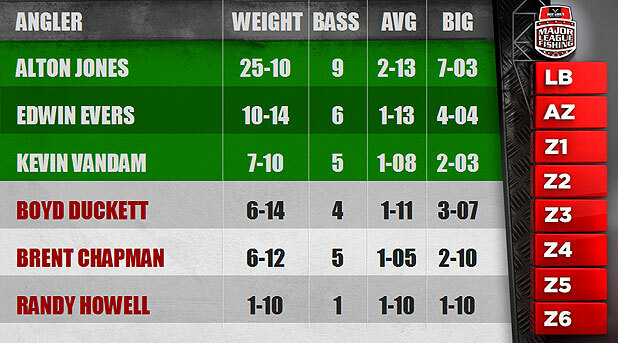 So tough were the conditions that the six-man field, which included three Bassmaster Classic Champions and two B.A.S.S. Anglers of the Year, only one angler eclipsed the 20-pound cutline. The remainder of the field fished the entire allotted time to decide the championship qualifiers. The weather created one of the more interesting rounds in the history of Major League Fishing. Due to the extreme winds, there were times that five of the six anglers were all visible within a 500-yard stretch of shoreline. The heavy winds were responsible for making the zone basically two small fishable areas. The competitors in Sudden Death Day Two were Brent Chapman, Boyd Duckett, Edwin Evers, Randy Howell, Alton Jones and Kevin VanDam. The anglers quickly found that even though their zone was quite large, it was going to fish very small when they began their 15-minute scouting period. With the winds coming from the northeast, they were basically going to be limited to a somewhat protected area between two islands. The winds made fishing any of the other areas nearly impossible. The morning, while still rough, was the smoothest part of the day, so the anglers needed to capitalize quickly. The first one to make an appearance on the leader board was Duckett, who posted the first three fish by 8:06 a.m. local time. Duckett's fast start soon slowed, as other anglers began to show some results. Evers and VanDam both struck at 8:18, with Evers' being a 4-pound, 4-ounce largemouth that put him atop the leader board. VanDam scored again 10 minutes later. It took more than a half an hour for Jones to land the next fish, followed by Chapman, who landed a quality 2-pound, 10-ounce Istokpoga bass to make his first appearance on the scoreboard. Then, Jones found a little pattern that would put him on a roll. He began putting the wind at his back, and pitching a soft stickbait to reed clumps. In doing so, he strung together four fish over the next nine minutes, interrupted only once by a score from Chapman. Both Chapman and VanDam scored again toward the end of the period, leaving Howell as the only competitor to not post a score. 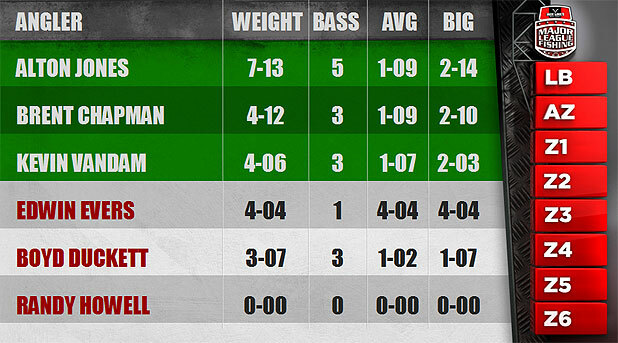 Jones' flurry gave him the early lead with 7 pounds, 13 ounces, followed by Chapman with 4 pounds, 12 ounces, VanDam with 4 pounds, 6 ounces, and Evers with his one kicker fish at 4 pounds, 4 ounces. Duckett's 3 pounds, 7 ounces, put him in fifth place and scoreless Howell brought up the rear. The second period started with Chapman and Evers making the first marks on the leader board. However, as if jumping out to an early lead wasn't enough, Jones boated a 6-pound, 7-ounce beast at 11:25. His big score put him more than double the weight of his nearest competitor. VanDam and Evers produced over the next several minutes, then Jones struck again at 11:41 with a solid keeper. Chapman registered a score, but Jones was hot and on a roll. He struck another blow, moving to within two pounds of the 20-pound cutline with a 2-pound, 13-ounce bass. Duckett boated a 3-pounder, followed by a score from Evers. Then Jones punched his ticket into the finals when he landed a 7-pound, 3-ounce giant, 32 minutes before the second period was over. While he did his post game interviews, the rest of the field continued to pursue the final two qualifying spots to the finals. Toward the end of period, Evers posted two more scores, while Howell finally made his first appearance on the leader board with about 15 minutes remaining in the period. At the end of the second period, Jones was already on the trailer with a total weight of 25 pounds, 10 ounces. 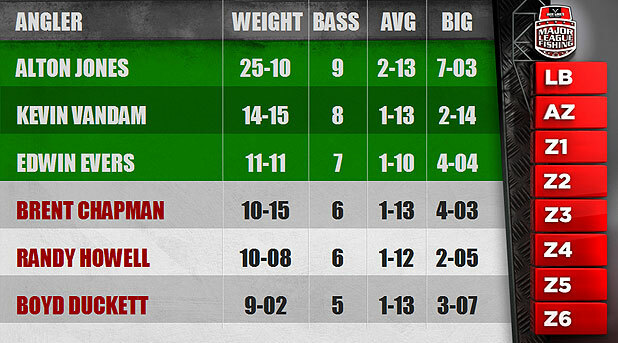 Evers was in a distant second place with 10 pounds, 14 ounces, VanDam third with 7 pounds, 10 ounces, Duckett fourth with 6 pounds, 14 ounces, Chapman fifth with 6 pounds, 12 ounces, and Howell remained in last place with 1 pound, 10 ounces. The remaining five anglers began the third period with the knowledge that the worst conditions of the day were getting closer. The bands of clouds on the outer edges of Sandy were coming fast, bringing stronger winds and heavy rain bursts. With that in mind, the field set out to try and reach the cutline despite the less than favorable conditions. The five anglers were only able to produce a total of 11 keepers during the final period. Of those, Howell and VanDam produced eight. Each of the other anglers only managed a single keeper apiece. By the time the clock ran down, VanDam's final period of three fish increased his total to 14 pounds, 15 ounces, enough to make him the second qualifier. Evers produced one more keeper and was able to hold on to third place with 11 pounds, 11 ounces, just ahead of Chapman who finished with 10 pounds 15 ounces. Howell made a hard charge at the end and finished in fifth place with 10 pounds, 8 ounces. Duckett fell to sixth place with a total of 9 pounds, 2 ounces. In what could go down as the toughest fishing day in Major League Fishing competition, Jones emerged to dominate Sudden Death Day Two. Though they didn’t reach the 20-pound cutline, VanDam and Evers weathered the storm to score enough total weight to squeak into the championship round. Now all that remain are one final day and six outstanding anglers to determine the champion of the Jack Link’s Major League Fishing 2013 GEICO Challenge Cup. The fireworks are sure to continue.